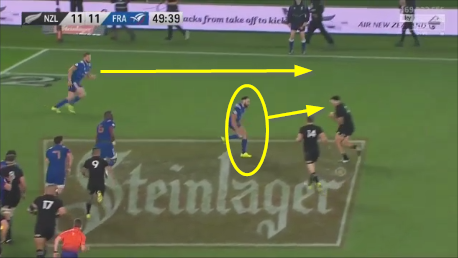 The recent first Test between France and New Zealand at Eden Park provided some terrific examples of attacking and defending in the 13 channel. 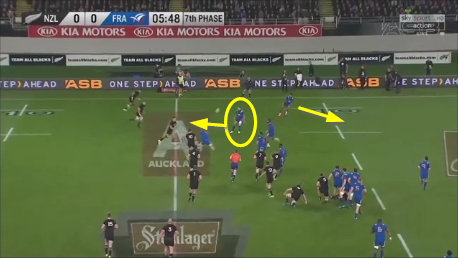 For longer than anyone can remember, the All Blacks have been the best in the world at making a positive second pass, and using the full attacking width of the field across to the far edge. France meanwhile had the meanest defence in 2018 Six Nations tournament, conceding a mere six tries in five matches – the lowest total of any team in the championship. The contest between New Zealand’s wide attack and the French defence of the same area promised to be one for connoisseur, and so it proved. 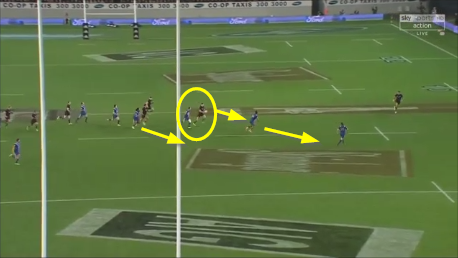 Rather neatly, the lessons from Eden Park fell into two parts. 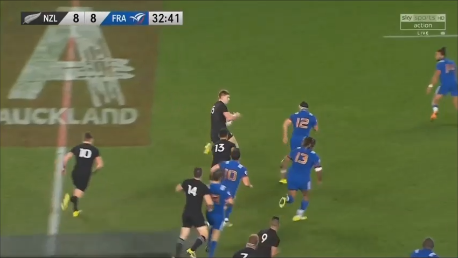 The French defence controlled the first 50 minutes, the All Black attack took over completely in the final half hour. 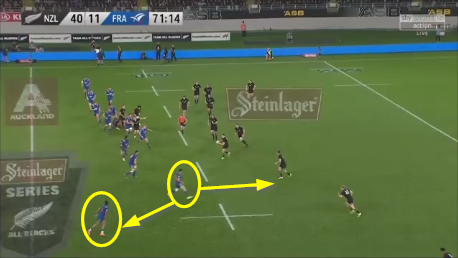 In the current pair of articles, I intend first to examine how France’s defence in the 13 channel succeeded initially; in the second the reasons why the All Blacks’ attack wrested control. The first 50 minutes provided several highly-instructive examples of successful defence in the 13 channel – the modern way. Despite wearing number 12 on his back, the man entrusted with the organization of the French back-line defence was La Rochelle’s Geoffrey Doumayrou. It is not the sort of job you can give to his centre partner, 125 kilo Matthieu Bastareaud! Doumayrou (in the headband) pushes up into the space on the outside shoulder of the potential second receiver as the ‘point man’, he is the highest line defender upfield. The wing outside him (#14 Teddy Thomas) plays about five metres off Doumayrou as a ‘half-and-half’ defender. Thomas is at first uncommitted, able to move up alongside Doumayrou or drop towards the backfield. The idea behind this set-up is provide immediate pressure on the second pass while covering the kick in behind the line with the wing’s flexible positioning. This instance occurs on the left side of the defence, with #11 Remy Grosso as the wing outside Doumayrou. Doumayrou has again pushed up as the high defender, with Grosso playing the ‘half-and-half’ role. This is the ideal outcome for the defence. Taylor gets Doumayrou’s tackle at the same time that he receives the ball, and Grosso recognizes the opportunity to shoot up outside him and on to the loose ball that the pressure has created. He is one hair’s breadth away from kicking the ball through on a breakaway – Grosso had already scored one try in the game on an interception from a similar situation. The defender in the 13 channel is the joint in the defensive structure, and it is his responsibility to decide whether the play is coming inside him, straight ahead, or to the outside. Sometimes he is not able to press up, and simply keep on pressing up. He has to be able to judge when to break off his forward movement and join a drift to the far side-line, and that is one of his most important assets. 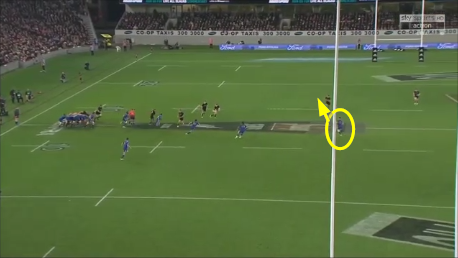 The spacing between the three main defenders (Bastareaud, Doumayrou and Thomas) is perfect as the drift unfolds, and the shot from behind the posts shows that the French number 12 has won his battle with the Barretts. 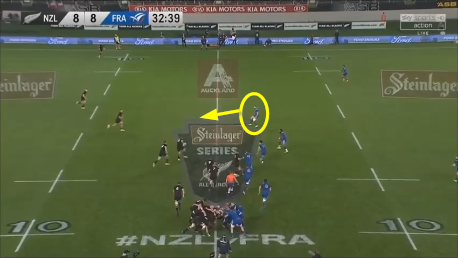 Jordie has been forced to kick across to Rieko Ioane, who is already well-covered by the French full-back Maxime Medard. 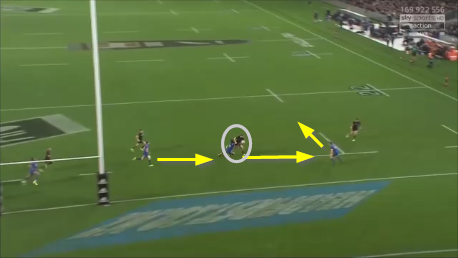 In this instance, all three of blind-side wing Ben Smith and the two centres (Lienert-Brown and Ryan Crotty) have crashed down hard to hold the French inside D.
The drift is again perfectly-spaced, with Thomas in position A1 to guard Jordie Barrett as he makes his move to the outside, and the final defender (full-back Maxime Medard) ready to break into the space between Barrett and #11 Rieko Ioane on the interception. Summary Defensive teams at all levels need a good decision-maker in the 13 channel, a player who can match wits and physical ability the first two playmakers on the offence. France’s Geoffrey Doumayrou showed all the attributes necessary to run a modern defensive structure in the wide channels efficiently in the first 50 minutes of the first Test at Eden Park. He made good decisions when to press and when to drop off into a drift, especially on the French right side with Teddy Thomas’ speed outside him. For 50 minutes at least, the All Blacks were denied the attacking freedom to which they have been accustomed. 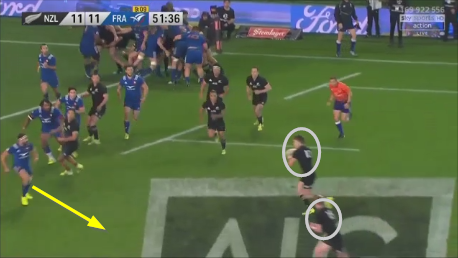 The second article will examine the ways in which New Zealand eventually unlocked the French D in the wide channels, successfully ‘problem-solving’ in the last half hour of the game!